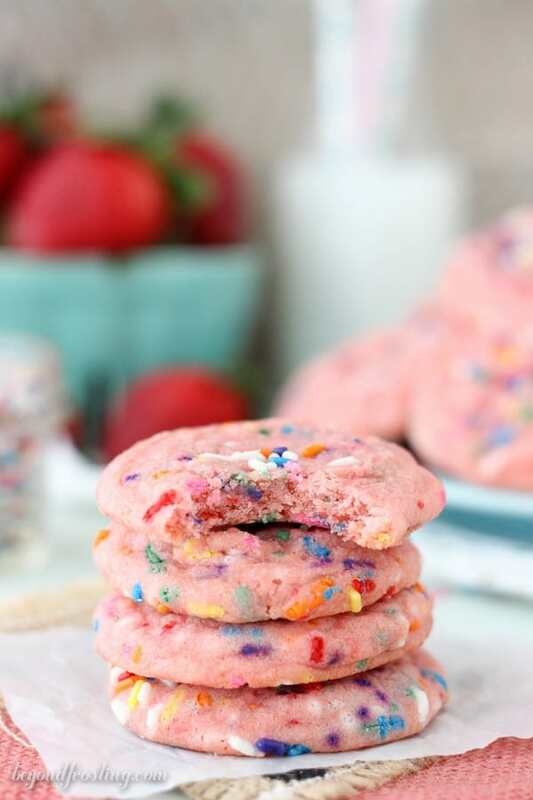 These Strawberry Funfetti Cake Mix Cookies are a chewy strawberry cookie made with cake mix and loaded with sprinkles. I am just coming back off a much needed weekend in Bass Lake, which is outside of Yosemite. It is by far one of my favorite spots to go. It is so relaxing to just hang out by the lake, take the boat to get lunch and ice cream for evening desserts and of course the food! Lake food is always better, no matter what. Especially because I am usually not the one cooking! Plus, this year, I go to debut my cookbook to all of our friends for the first time! That’s right! I just got my copy in the mail over the weekend and you guys, I totally cried. It was the most surreal feeling in the world to actually be holding my book. It’s one thing to tell someone you wrote a cookbook, but it’s a whole different story to hold a book that you actually wrote. Just a quick reminder to turn on QVC this Wednesday at 8pm EST/ 5PM PST, I will be on live with David Venable for “In the Kitchen with David”, trying not to make fool of myself. You guys, I am beyond nervous. Enough about me. Today is all about my dear friend Ashley at Spoonful of Flavor. Ashley announced back in April that she was having her first baby, and it’s a girl!! I am so thrilled for her. It’s always a special moment when a friend gets pregnant, especially with her first child. Plus I am sort of obsessed with her nursery. Ashley and I met through blogging a couple years ago at a food conference. We quickly gravitated towards one another because we are around the same age and both work full time outside of our blogs. Ashley’s work is stunning, her photography is jaw dropping and her desserts keep me coming back for more. I always enjoy the times we get to spend together, even if it is few and far between. 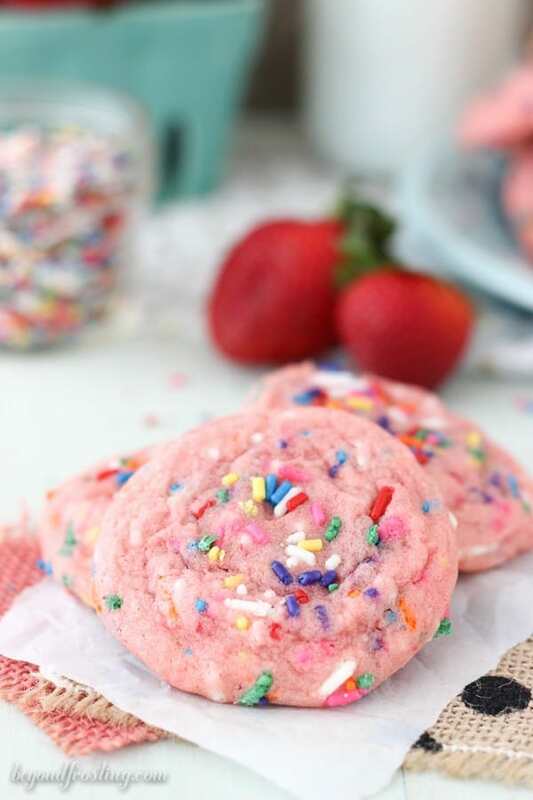 For today’s strawberry-themed baby shower, I’m bringing these Strawberry Funfetti Cake Mix Cookies. 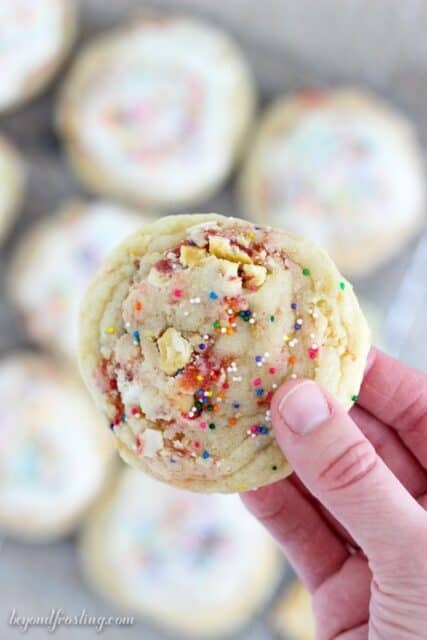 I think you guys know that I love using cake mix because it is so darn convenient, plus it makes cookies SO chewy. With the cake mix, it gives you the opportunity to be SO diverse with your flavors. 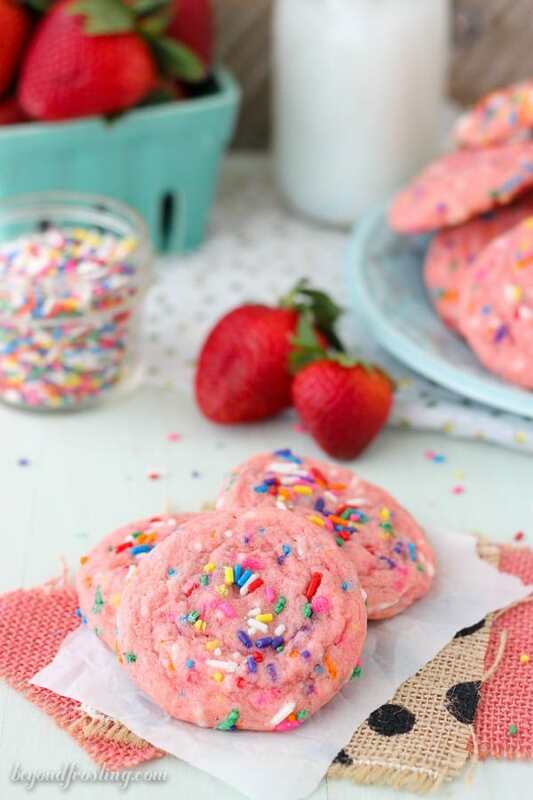 A couple months ago, I shared a Strawberry Funfetti Poke Cake, and I happen to have made these cookies in the same weekend. I’ve been waiting for the perfect opportunity to share these cookies with you. 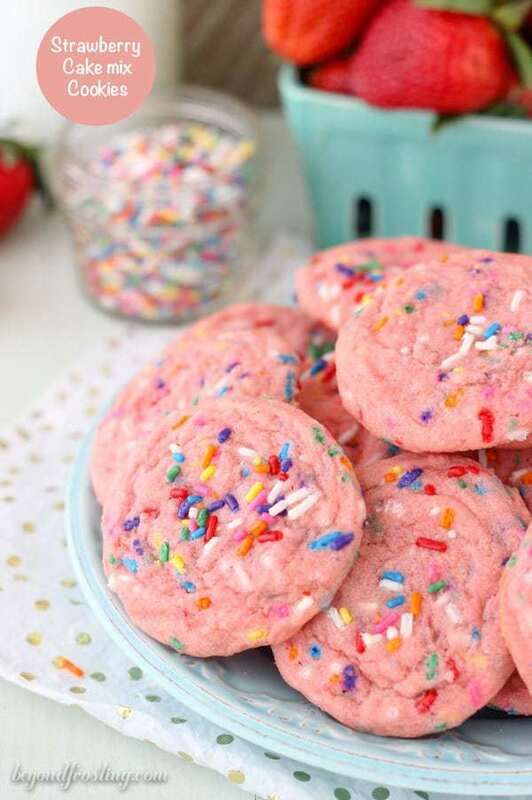 A baby shower seems totally appropriate for pink colored cookies right? For these cookies, you’ll need a box of strawberry cake mix, such as Pillsbury. Then just throw in your average cookie ingredients and grab some sprinkles. I mixed some sprinkles in the dough and then right before baking, I added a few sprinkles on top. Just wait until the edges are starting to get crispy and pull them out of the oven. I let them cool a bit on the cookie sheet before removing them. They are just slightly under baked in the middle, which also helps keeps them super soft and chewy in the middle. 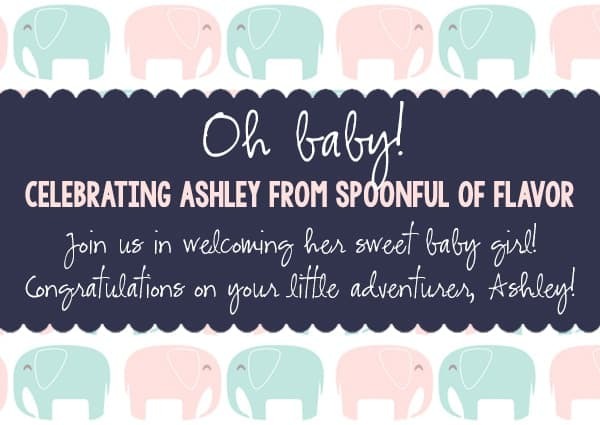 A huge congrats to Ashley on her pink bundle of joy, I hope I get to meet her soon! Allow the butter to soften to room temperature for 20 to 30 minutes or microwave the cold butter for a quick 12 seconds. In a medium-sized bowl, combine flour, cake mix, baking powder and salt and whisk until blended. Slowly add the dry ingredients into batter and beat on medium low speed until well combined and dough forms. Add ½ cup of sprinkles to the dough and mix until the sprinkles incorporate. Spoon 2 tablespoons of cookie dough onto a lined baking sheet. Gently press the top of the cookies down with the back of spoon or spatula and you can add a pinch of sprinkles on top if you would like. Bake at 350° F for 10 to12 minutes. 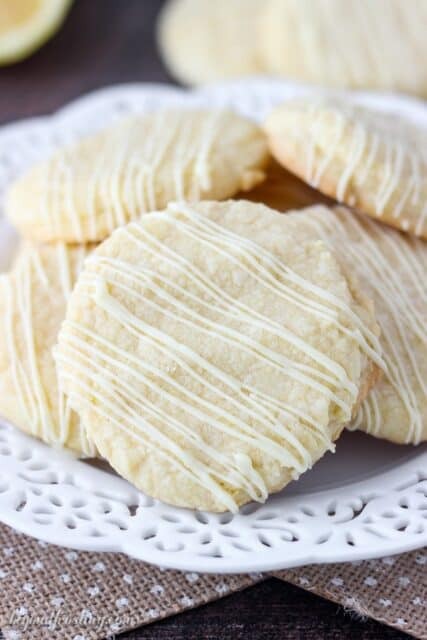 Allow cookies to cool on the pan for several minutes before transferring to a wire rack. Cool completely. These are such pretty cookies! Perfect for a party! 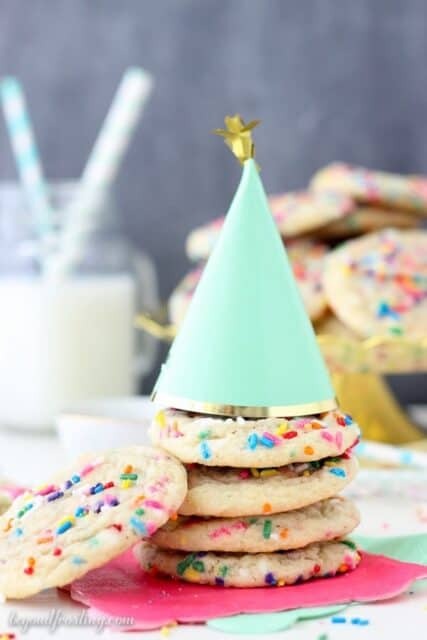 Those look like the perfect party cookie! These cookies! I could eat a dozen at least! That is so fun that you finally get to see your cookbook. It must be so satisfying seeing all that work in your own two hands. Congrats to both you and Ashley!! 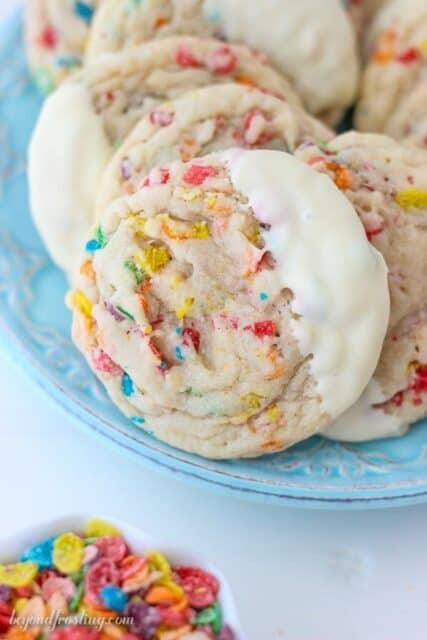 We love funfetti cookies!!! especially love the strawberry cake mix!!! I will be watching you on Wednesday!!! woot woot!!! so happy for you! 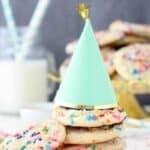 What a fun and easy to make cookie! I love that pretty pink color, the strawberry flavor and of course the more sprinkles the better! I can’t wait to see you on QVC, you are awesome lady! LOVE these cookies! Strawberry cake mix is my fave cake mix. AND I CANNOT WAIT TO SEE YOU ON QVC! AND GET MY BOOK! AHHHH!!!! You will ROCK! Julianne, this is AMAZING! It was the best surprise to wake up this morning to such a sweet celebration. The only thing that would make it more perfect is if we were all together to celebrate. Everything from the strawberry recipes to the pink and elephant theme is incredible. I am so thankful to have such a great friend. Thank you so much for always supporting me! I can’t wait to make a big batch of these cookies. Thank you, XOXO!! These cookies make me SO happy! Adding them to the list to bake with the kiddos this week.